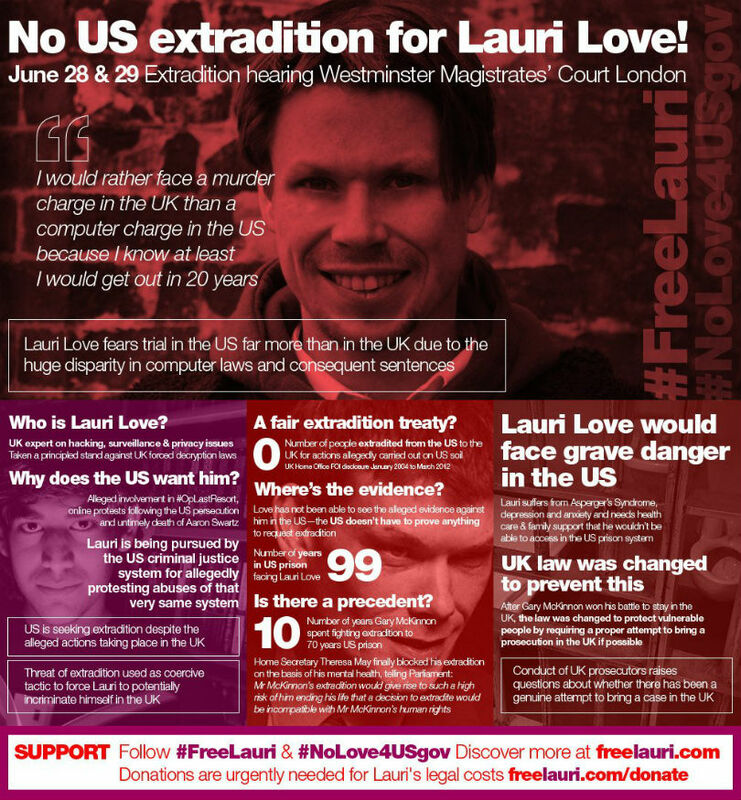 In a break with a precedent that had been established in 2012, British District Judge Nina Tempia earlier today rejected British student and activist Lauri Love‘s appeal to deny the United States of America’s request to extradite Love to the U.S., where he faces charges. He has the right to appeal the ruling, and Love and all the members of his legal team pledged today that he will appeal. He was allowed to remain free on bond. Charges were filed against McKinnon in 2002 in the U.S. and an indictment was handed down. The U.S. and its allies have extradition treaties, and in 2003, Britain passed into law a new extradition agreement in which American authorities do not need to provide contestable evidence in support of an extradition request. It took a full decade, but in 2012, Britain’s Home Secretary at the time, Theresa May (who is now the U.K. Prime Minister) blocked the extradition request and said, “Mr. McKinnon’s extradition would give rise to such a high risk of him ending his life that a decision to extradite would be incompatible with Mr. McKinnon’s human rights.” He was not extradited, and, soon after, the case against him was dropped, because the evidence against him was not available in Britain. In her decision today, judge Tempia expressly rejected the arguments made that the Lauri Love case falls fully under the protections offered by the forum bar. His case is an update, as it were, of the McKinnon case. I accept Mr. Love’s connections to the United Kingdom include his own personal circumstances, his health and his support network, and not merely his connection to the State, as submitted by Mr. Caldwell. Some of the evidence in this case is transportable but, in my assessment, those factors do not outweigh the facts that the conduct occurred in the United States, all the victims are in the United States, their interests are best served with the case being heard in the United States and any delay is not known because I do not have any evidence as to how far any investigation has taken in the United Kingdom. What I do know is that evidence has been produced by the United States resulting in three Indictments (sic) being issued by three Grand Juries. It is the interests of justice for the case to be tired in the United States and for this reason the forum bar fails. The judge adds: “There are over twenty witnesses, all of whom are in the United States. The digital evidence could be given in the United Kingdom but the witnesses reside in the United States and as a matter of desirability and practicality it is easier for them to give evidence in the United States.” This despite the fact that the judge accepted testimony from many witnesses on Love’s behalf who spoke from America via video link. Lauri Love has not yet set foot in the United States. Certain parties in America—the NSA and the U.S. Justice Department—want to change this for the 31-year-old Briton. They want to extradite him to the U.S. to face an as-yet unknown number of charges, which have been filed in three districts. It is a complicated legal case that involves different laws in two different countries, the United Kingdom and the U.S. He was arrested in October 2013 by the U.K.’s National Crime Agency (NCA), which seized 31 digital media items from his home, where he lives with his parents. (Lauri has Asperger’s syndrome and does not live on his own.) Among the items were computers and external hard drives and SD cards, on which the NCA found … files that were password-protected and otherwise encrypted. Because Love may have been a part of the hacks against the U.S., which led the U.S. to charge Love with “stealing confidential data,” and because he had files that were password-protected, the authorities assume that the protected files have something to do with the hack. Britain’s NCA served him with an order to compel him to turn over his encryption keys. Love ignored the order. The NCA also sent screenshots of the encrypted files to the United States, which led to the extradition request. In 2015, the authorities returned materials to Love but held six: a desktop computer, two laptops, two external hard drives, and a SD card. One of the many ironies in this case is that Love and his representatives have not been shown the evidence against him, because that so-called evidence is password-protected and no one has seen it. If Love were to give the authorities the encryption keys and passwords, and the files turn out to be photos of rainbows and puppy dogs and nothing more, he might free himself but he will have injured the centuries-long fight against self-incrimination. As things stand, he is facing charges that can only be given legal merit through self-incrimination. In a brilliant move, Love filed a civil suit to get his property returned to him. The NCA took this as an opportunity to compel him to give them the encryption keys. In essence, their court filing read that they would be happy to supply him with his property but the only way they could be really, really certain it was his property was if he would be kind enough to supply the passwords and encryption keys that they needed to coincidentally use to charge him with other crimes. Love’s suit to force the NCA to show its hand was a brave stand on behalf of privacy and against self-incrimination. Judge Tempia declined to set the precedent that would have established self-incrimination is the legal means to prosecuting whistle-blowers, journalists, and reporters’ sources. The extradiction request from the United States remains, and tomorrow the same judge, Nina Tempia, will hear arguments. A ruling is expected this week. The ruling came on September 16, 2016. See above. The Courage Foundation, which has been aiding Love in his legal fight for his life, estimates that if Love is sent to the U.S. to face the charges (the number of which remains unknown), and if he is “convicted of all charges and the sentences are served consecutively, he faces a maximum sentence of 99 years in jail in the United States.” An argument against sending him here on humanitarian grounds is being filed. Click for full size. Copyright Courage Foundation.